Getting your Starfleet uniform ready for Halloween? 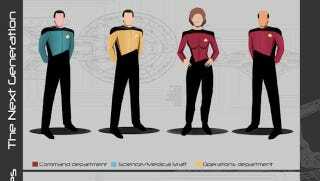 Make sure your get the details right with this visual guide to Trek uniforms. I've never seen them all laid out together like this — pretty cool! Hey, remember that time in the 23rd century when Starfleet decided all the female officers had to wear short skirts? Man, that was crazy.